I love a really good charcuterie plate. Some meat, cheese, a few accompaniments, and some good bread makes me a happy camper. It’s not typically something you think of as a breakfast item as it tends to lend itself more to an afternoon repast or the opening act of an excellent dinner. However, just because it isn’t typical, doesn’t mean it isn’t delicious. 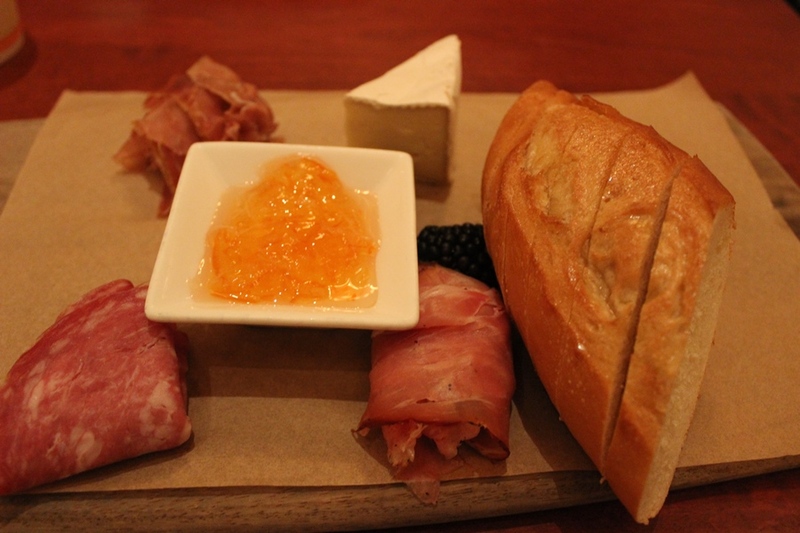 Case in point, just lay your eyes on Be Our Guest’s Assorted Cured Meats and Cheese. They give it a different name, but we all know its charcuterie for breakfast! The smorgasbord comes with alpine-smoked ham, serrano ham, sopressata, and cheese (read: brie) with marmalade, fresh fruit, toasted baguette, and a selection of pastries. The combinations here would seem rather simple, especially considering that you are only given a single hunk of cheese. Pick a meat to go with the brie and pile them high on a piece of baguette or slather a slice of bread with some marmalade, but there are some many other options. Pair the brie with some of the marmalade, or a blackberry with some of the sopressata, I promise you however you choose to go about setting up each bite, you’re going to be happy. In fact, if there is a drawback to this butcher board of meats and cheese, it’s that the portions are skewed. You have more meat than you know what to do with, although my assumption is that there will be a singular meat that you like more or less than the others. You have a suitable piece of brie, but it would be great to have a second cheese, perhaps something a bit more firm, to complement it. Also, the baguette you are given only has approximately five slices, and with a ton of combinations, I found myself wanting more of the soft, yet crinkly, bread almost immediately. 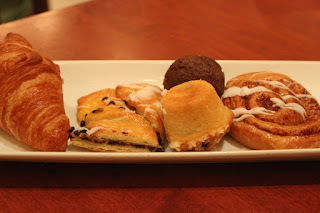 The pastry selection is standard for all breakfast meals at Be Our Guest, but that doesn’t mean it should be overlooked. There are assorted muffins, a croissant, a chocolate croissant, and even a miniature cinnamon roll. Also, if you group polishes off the entire plate, they will bring you more! I recommend diving in to make sure you get either the chocolate or traditional croissant. This is a terrific meal to start your day on. The bread, cheese, and meats pack in enough protein and carbs to help you make it to wherever your lunch might be that day. To get good brie and an excellent marmalade, my favorite of the jam and jelly family by the way, inside the Magic Kingdom is more than I could have as for. It may not be what you think of as traditional breakfast fare, but in true Be Our Guest fashion, it does not let you down. There is an argument to be made, especially after the expansion of Fantasyland was completed, that the Magic Kingdom is the most complete park in all of Walt Disney World. Making a quick check of the circuit, Epcot has needs both in Future World and around the lagoon of World Showcase, Disney’s Animal Kingdom continues to plus its experiences, but could definitely expand, and Disney’s Hollywood Studios, in the midst of a massive renovation, has been in need of targeted growth and development for years. Looking around the Magic Kingdom, there is a lot of good to be seen. Great dining, wonderful classic and modern attractions, and stories can be found around every corner. If there is one area that could be pointed to as a blight on an otherwise stellar park, however, it would be Tomorrowland. In fact, the problem with Tomorrowland might actually be terminal because it can’t answer the founding principle upon which it was built. That is to say that if you were to ask for a definition of Tomorrowland, there has never been a clear cut answer. The land has an identity crisis that isn’t easy to solve. There have been some brave attempts to do so over the years, not the least of which was the land’s complete overhaul in 1994, but nothing has ever stuck. The inherent issue stems from how fast technology moves. While sixty years ago it was believed we’d have flying cars by now, the lack of flying cars doesn’t mean that things have sat still. Things we could only have dream of a decade ago are now commonplace in society today. Defining what tomorrow looks like means that there is a finite amount of time that you have before that image becomes one of two things, either it becomes true in the here and now or it begins to look like a farcical daydream. In terms of it becoming true, you’ve now turned at least some portion of your vision of tomorrow into a look at today. Remember the gag in Meet the Robinsons where they flew by the amusement park called Todayland? That’s what can happen with a realistic view of tomorrow. The other idea is to look at the world of tomorrow through the lens of science fiction. Creating a world that could never be, or one that relies upon another theme to get us there. Some of the golden age of this futuristic imagery has a lot in common with steampunk aesthetics. Utilizing this pair of themes you can come up with some pretty far out ideas that would likely never come to pass in any way, shape or form. Of course, by blending two possible ideas, or finding a point at which they intersect, it means that you’ll have to cast aside some other clean and clear ideas or visions that could lend you credibility. Creating this intersection of reality and daydream is just what Tomorrowland received as refurbishment infusion in 1994. There was a community of tomorrow, utilizing pieces of what we knew could be with fantastical visions of what could never be. To give Tomorrowland a sense of place and time, everything revolved around this idyllic community. Transportation lines, a lighting and power company, museum exhibits, and convention centers were all part of the world that guests could visit as part of the land’s attractions. 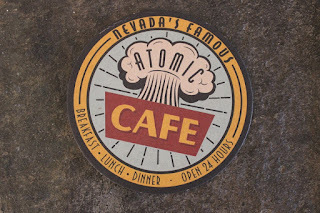 There were even signs for restaurants, civic organizations, and housing options that were created solely to give Tomorrowland a lived-in, larger than life vibe. Over time, however, much of these components have lost their sheen or been cast aside completely. There are out of place characters, I’m looking at you Monsters Inc., and even some of the aesthetics have begun to be shuffled off. The cornucopia of gears and robots for all occasions that once permeated the land have started disappearing. 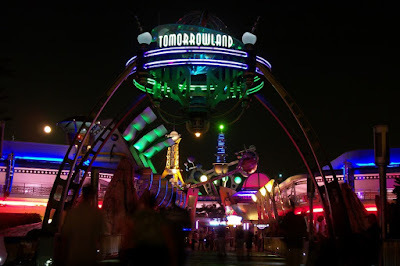 Tomorrowland has become a melting pot of various visions of future, and I don’t mean that in a good way. It no longer has a dedicated mission or vision that guides it and all of the components that live within its borders, but it is high time Tomorrowland did some strategic planning. I’m not saying that it should all fall under one banner or a single IP. Let me pause here and say that as much as I love Star Wars, I am certainly glad that the land dedicated to it is going to be housed in a park more befitting the property than in the Magic Kingdom where each land should be filled with different stories. 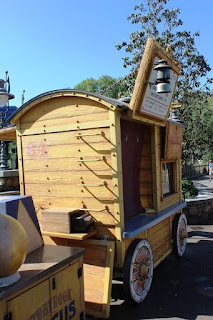 There are, however, plenty of stories to gleam attractions and theme from. Everything from Lilo and Stitch to TRON, 20,000 Leagues Under the Sea to WALL-E, there are places where each of these could find a home alongside the PeopleMover and Space Mountain or assist in defining the style and setting of Tomorrowland. There isn’t an answer to how to define Tomorrowland, there are a number of answers. All of them could be right, but it takes guidance and a clear vision. It should look out of this world, but it shouldn’t be populated by the toys under our beds. It should be a place where ideas are exchanged, but not with yesterday’s news. Tomorrowland should always be reaching for our wildest dreams, both real and fanciful. With all that lies ahead for Walt Disney World, we are likely years away from ever seeing the land shine like the beacon of tomorrow it should be and deserves to be. 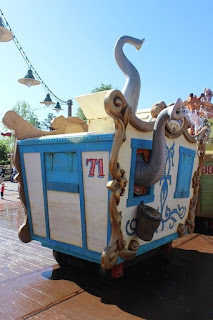 Storybook Circus has a lot of fantastic details strewn about the land. There is name-checking luggage, subtle and no-so-subtle nods to Walt and the Carolwood Pacific Railroad, and even some musical cues and props to take note of. Some of the most interesting details, however, come from the various train cars and wagons that can be found throughout the land. We’ll start our numeric tour over at the Casey Jr. Splash ‘N’ Soak Station. This is a great little area for children to let off some steam, Casey Jr. certainly does! The monkeys, giraffes, and other circus creatures are all having a bath, or a holiday, or whatever cartoon animals do when there is a bunch of water around. Now, there’s a Jungle Cruise joke about water in here, but I’ll leave that to your imagination. What I’m really after are the numbers on the back of the train cars. Chronologically, they are: 71, 82, 89, and 98. We’ll keep this one simple; they’re the dates in which the four parks of Walt Disney World opened. Now that we got the hang of the pattern, we can quickly puzzle out another one. 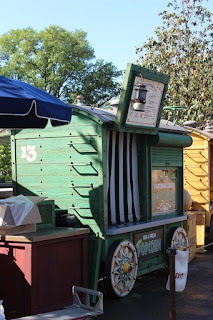 Heading on over to the wagon serving up hot dogs, emblazoned with the number 55, an obvious stand in for the 1955 opening of Disneyland. The first park which saw the Dumbo, The Flying Elephant attraction take to the skies as an opening year attraction. Next up, we’re going make our way over to the popcorn wagon, popcorn and the circus just go together, right? Its wagon number of 13, however, has thrown me for quite some time. 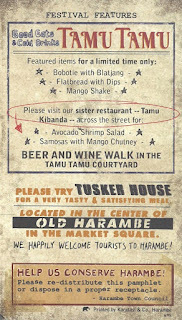 While I can’t be 100% certain, my best guess is this relates to the dedication of the Storybook Circus area as a whole. It is my belief that the plan was for this land to be dedicated and officially opened in 2013, even though pieces of the land had come online much earlier than that. However, the land ended up being officially opened in December of 2012. Now, if someone has a better explanation of this number than I do, I would be happy to be proven wrong! 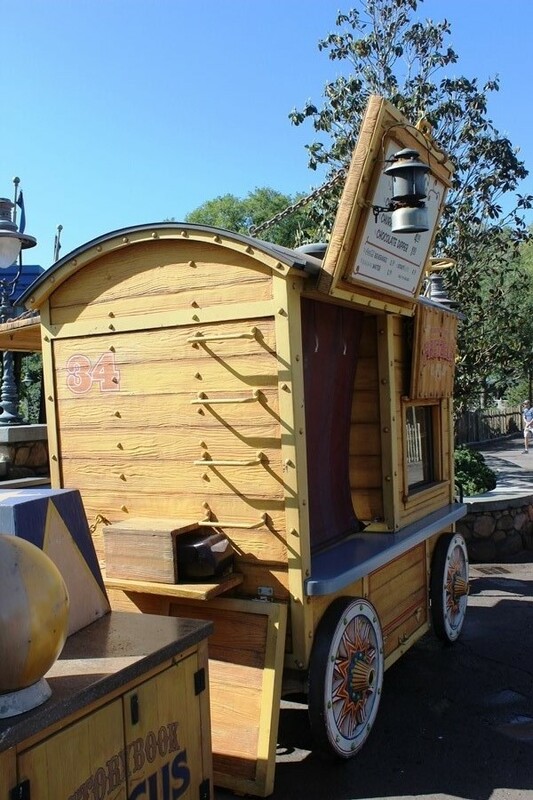 The last, but not insignificant wagon to be numbered in Storybook Circus is the number 34 pretzel wagon. We’re venturing back in the 1900s for this one and 1934 may not be a date that many readily recognize. It was actually a fairly busy year for Disney. It could be referencing Ward Kimball’s arrival to the company or the copyright of Mickey Mouse for books and comics, but we’re actually in Silly Symphony territory on this one. What short could tie in to the Dumbo theme of the area, you ask? How about a cartoon entitled The Flying Mouse that features a tale about a little mouse who saves a butterfly, a butterfly that is in fact a fairy, that is able to grant the mouse’s wish to fly? After being granted this great power, he finds he is reject by mice and bats alike and just wishes to be himself again, a wish the fairy butterfly is happy to bestow upon him. 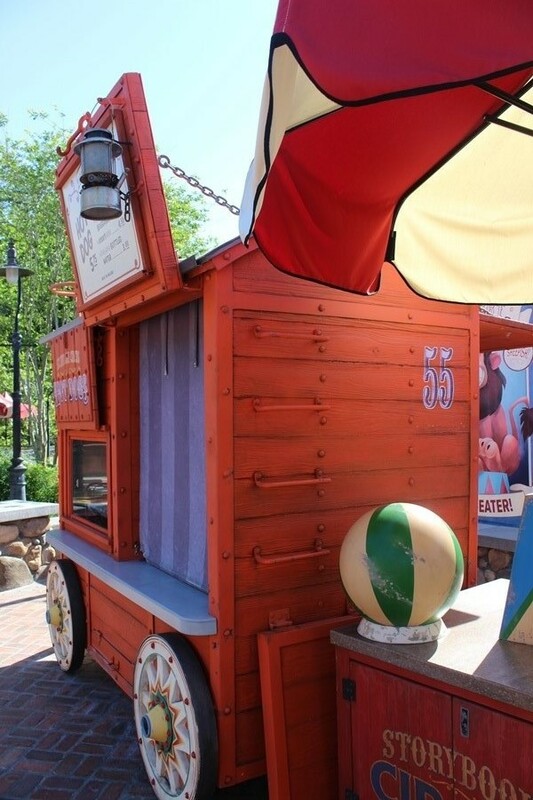 The wonderful minds of Imagineers continue to find new ways to tuck away small details that pay homage to the history of all things Disney, big and small. Each new attraction, restaurant, or land is filled to the brim with these nods, some that are clear as day and others that require a bit of historical perspective or perhaps research, both of which can be seen in the numbering of the train cars and wagons of the Storybook Circus. 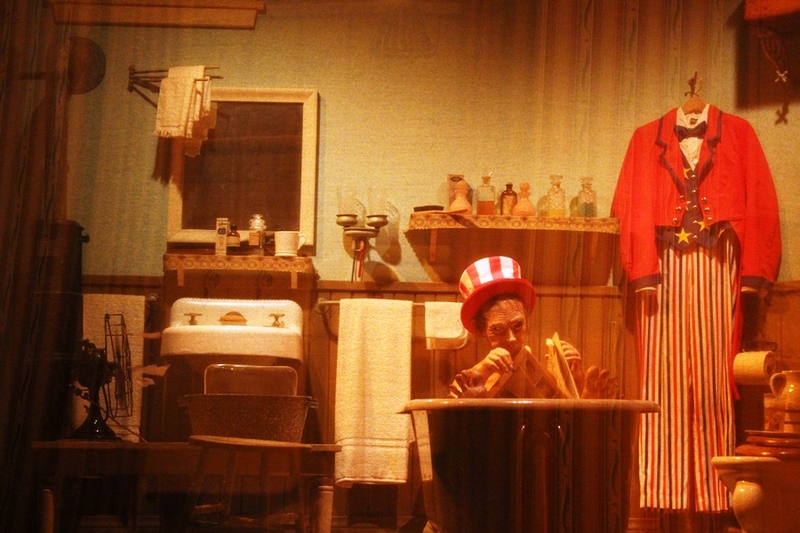 It’s a great big Walt Disney World out there, and there are always more stories to uncover! Often times we talk about taking time to stop and take in the story around you. The details that are up down and all around which lead to guests experiencing a more cohesive story. However, that’s not the only reason to stop rushing from place to place. Sometimes there are other things to enjoy in between the rush to see all of the restaurants and attractions that a well worth the investment of time, you simply have to stop and enjoy them. We not even talking about the resorts, we’re going to keep ourselves solely contained to the parks. 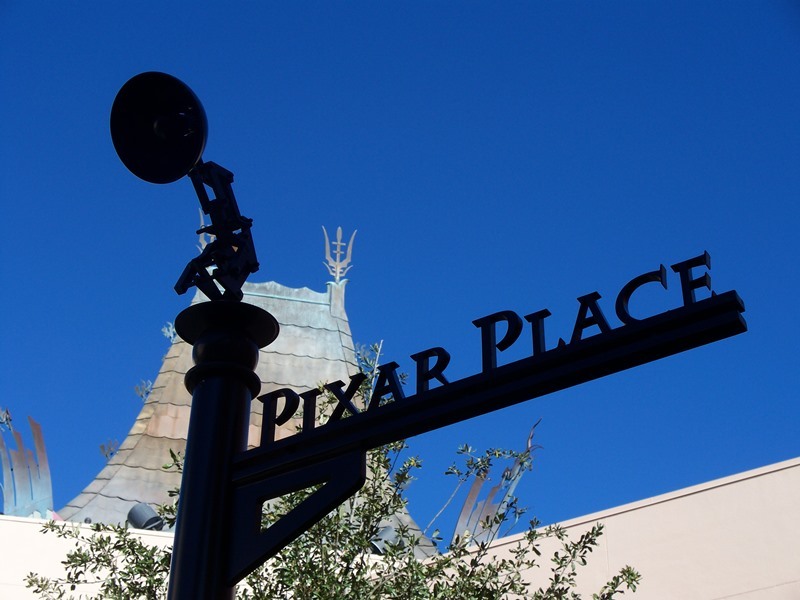 So, here are a few of our favorite ways to spend time in the parks. 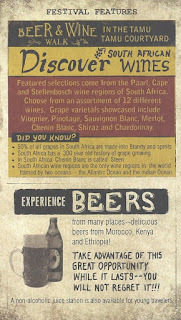 World Showcase – We’re starting big, huh? 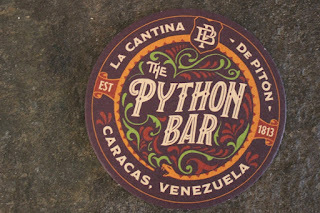 Seriously though aside from The American Adventure and Frozen Ever After, or La Cava del Tequila and L’Artisan des Glace (not that we don’t love all of these things! 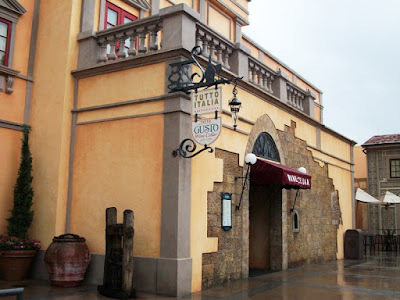 ), there is a whole lot of the world to be discovered in World Showcase. Think of the variety of musical, comedy, or street performance acts that populate almost every single pavilion around the lagoon. From the drums in Japan, the mariachi in Mexico, the acrobatics present in China and France, and these are just the tip of the ice. 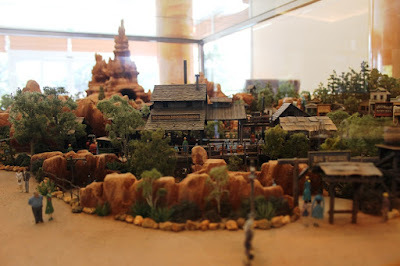 Consider also that there are galleries in a majority of the country pavilions, and now you’ve put two pieces together that are critical for the success of World Showcase: edutainment and air conditioning. For my part, I could and have spent hours in the back corner of Japan or France, tucked away in the shade, relaxing, taking in the ambient music, and watching the World Showcase go by. There are a lot worse ways to spend an afternoon, I guarantee you that! Animal Watching – Is there anything better than taking a seat and watching some of the most interesting or majestic creatures in the world meander through their day. Okay, so they don’t put a bench right in front of the tigers on the Maharajah Jungle Trek or by the lowland gorillas of the Pangani Forest Exploration Trail. 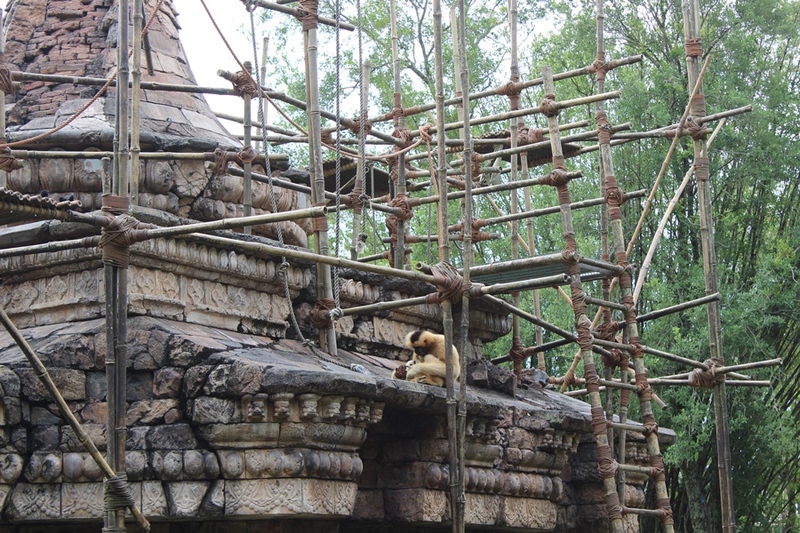 There are, however, places within Disney’s Animal Kingdom where you can take a seat and get in some quality time with the animals. In fact, it is the reason that many of the animal habitats are placed near or along thoroughfares, walking an animal trail is great, but that means you have to actively seek them out. 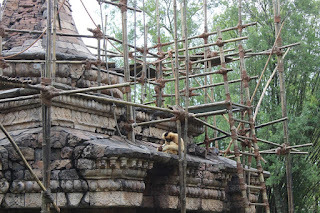 In Disney’s Animal Kingdom, many times you will happen upon them in between attractions. Even if you are on the trail, don’t rush from enclosure to enclosure. Stop and observe, ask questions if an expert happens to be there. I promise you, short of hogging an entire window to see the tigers all to yourself, if you sit back and remain in one place for a little while you will see and learn more than you ever thought you could, and no one will ask you to move or become perturbed. The Neon Hour – There is something to be said for World Showcase, Tomorrowland, or the whole of Disney’s Animal Kingdom at night. They are spectacular, but that’s not the time I’m looking for right now. The hour I’m thinking of is that perfect twilight time, between the sun setting and night falling. 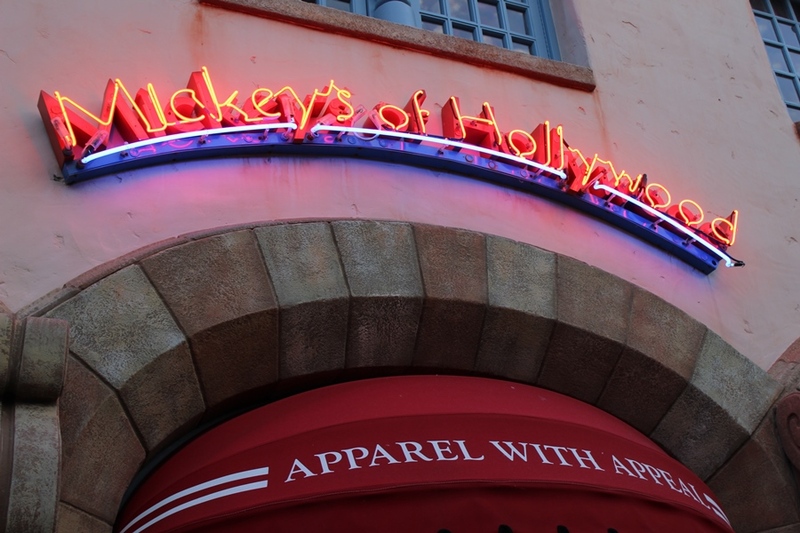 It is the absolute perfect time to stake out a bench on Hollywood Boulevard and watch the neon of the signs begin to glow. I don’t know what it is about that time, but it is the perfect time to take in the atmosphere of old Hollywood. Checkers – I’m going to play it straight with you, this photograph right here was the inspiration for writing this article. 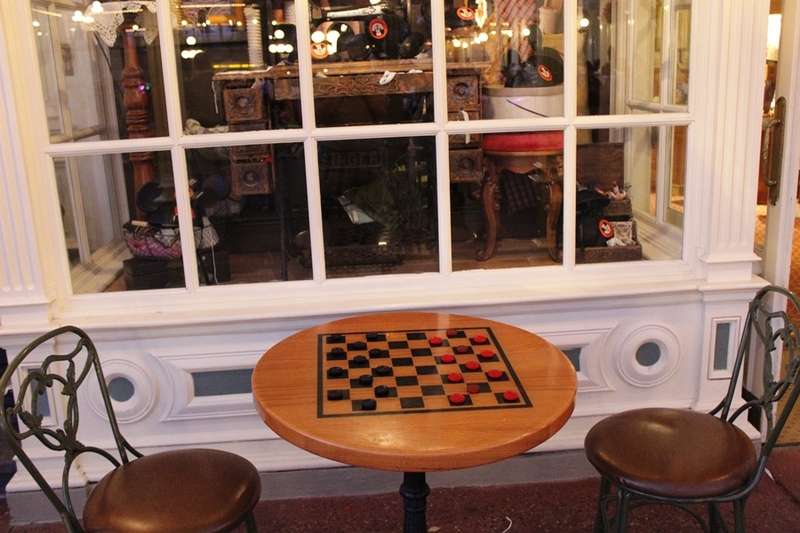 Checkers can be found in a multitude of locations around the Magic Kingdom. It is present on Main Street, U.S.A. in front of The Chapeau, and over in Frontierland by the Shootin’ Arcade, down by the Rivers of America in Miner’s Cove, and on Tom Sawyer’s Island at Huck’s Landing. Heck, it can even be found over at Fort Wilderness, but we’re not talking about resorts today, right? Seriously, is there any activity that is more reminiscent of our youths, more likely to bring on that competitive spirit and sense of fun, than a game of checkers? You can even use it to your itinerary’s advantage, pick two people in your party and let the game decide who gets to pick what the group does next. Or just relax and have a round robin tournament with your whole group! This is a topic we’ve revisited once or twice, but it is worth remembering. When you come to Walt Disney World there is a lot to do. So much so, that many people never actually get to do even half of the options that are available to them. Taking the time to enjoy where you are and the world around you is a big part of why people choose to vacation at Walt Disney World. It’s up to you how you spend your time, but remember that you are on vacation, so take some time to smell the rose! Or watch the neon! Or play a game of checkers! I’m certain you’ll be happy that you did. 7 openings for Miner roles. Must work well with animals, princesses and whistle while you work. Short hours. Call time: 6 a.m. Athletic abilities required. Guides will be selected from winners of Canoe Racers. Adventurous heroic role as a jungle guide and skipper. 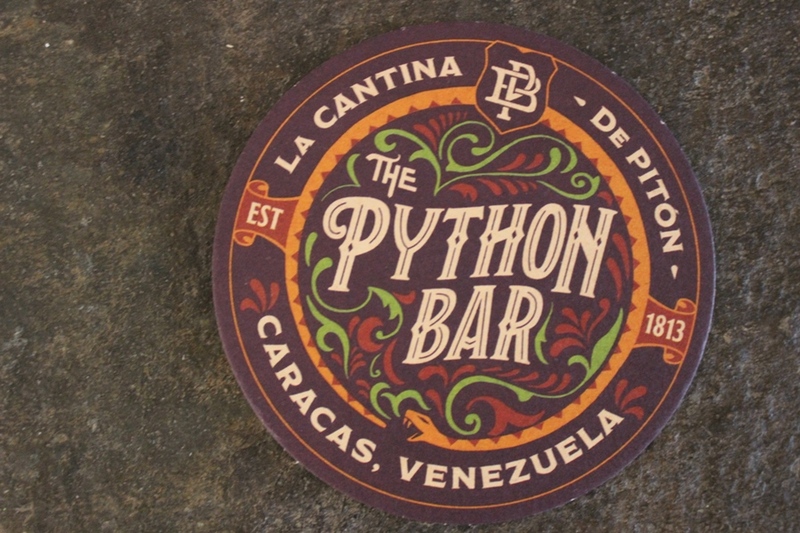 Must demonstrate bravado, comedic timing and nor fear of snakes. For auditions, contact T. Sam. A “starring” astronaut role in an out of this world science fiction adventure. Seeking ghosts and goblins to perform with ghoulish delight in haunted house musical. Spirited performers only. Auditions at Ghost Relations. Now casting crew members for submarine adventure. 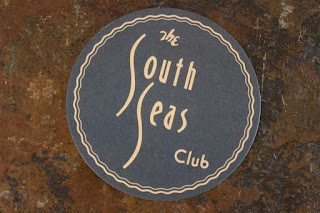 Mermaids needed for exotic location shoot. Swimming ability suggested. Must provide own sunscreen. Sought for Country Western Musical. Must play an instrument. Singing experience preferred. Trainers contact Big Al at C.B. Playhouse. Sought for alpine-themed production. Auditions First Snowfall, Matterhorn Mountain Features. Now casting: turn-of-the-century crew of an authentic period steam train. Contact Carolwood Pacific R.R. 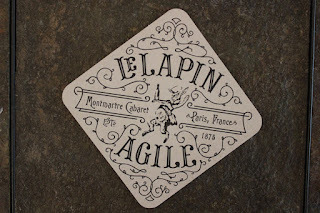 Needed for key musical role in turn-of-the-century production. No moustaches please! Aerial artist to fly in nighttime Extravaganza! See T. Kline for further info. Must be able to pass the mustard. American Parade Productions, rooms 1975-76. Experienced players only. 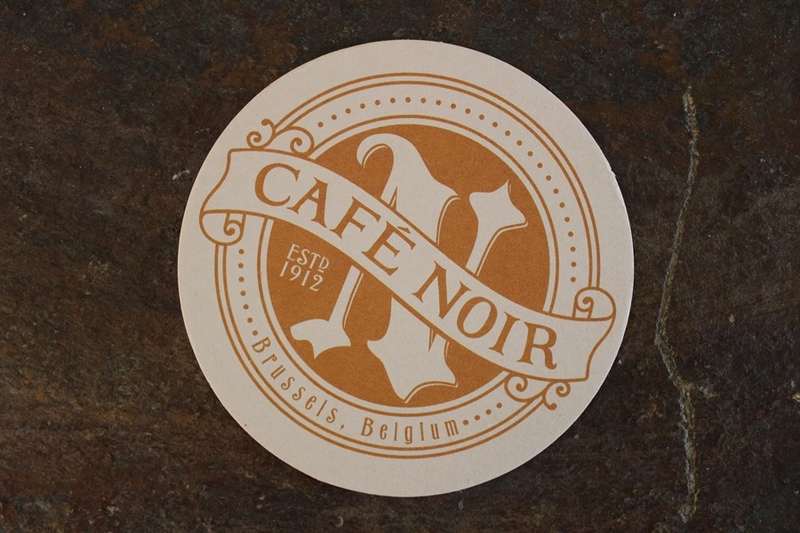 Auditions at Café Orleans, 15 Orleans Street. Polynesian dinner show coming soon! Auditions at Enchanted Tiki Room. A rogues gallery of pirates sought for Caribbean adventure. Some swordplay required. Eye patches optional. Now casting crew of 18th century sailing vessel. Must be able to climb rigging, shoot a cannon and circumnavigate the globe. Three year contract. Ask for Hawkeye. Cast sought for classic Mark Twain costume adventure, B. thatcher Productions. To perform traditional dances for daily live show. Must provide own costumes and headdresses. Old west revue requires energetic dancers and slapstick comedians. 25 year commitment. 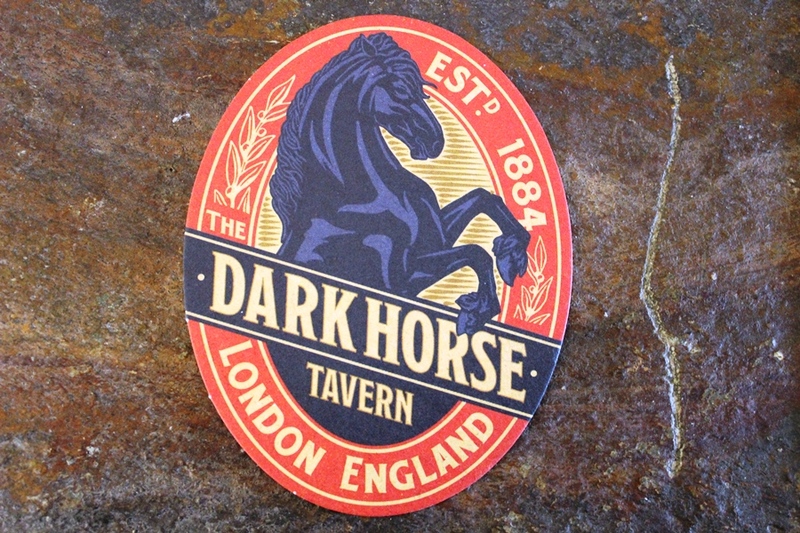 Apply Golden Horseshoe. Ask for Miss Slue Foot Sue. Childrens fantasy film needs extras to play Playing Cards, Singing Flowers, and a Doorknob. Singing, dancing and shrinking abilities a plus. Wonderland Featurettes, Room 10/6. Don’t be late. 1313 Harbor Boulevard. “We found roles for thousands… How about you?” Open daily. 1313 Harbor Boulevard. “We found rolls for thousands… How about you?” Open daily. Can you operate the mighty microscope? An inner space adventure needs you. Hurry! Opportunities are shrinking! Snowflake EFX Ltd. Rocket to the Moon (and back). No experience necessary. Report to Mr. Morrow, Moonliner Flight Systems. Must work with flying elephants. Trained in the magic feather technique. Send resume to: T.M. at our Florida office. Oversee hundreds of thousands of sparkling lights and electro-syntho-magnetic musical sounds. Apply: Entertainment Offices, Basement. 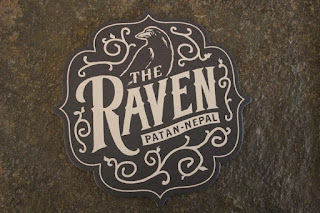 Needed for largest working wardrobe east of Main Street. See Quinn, 2nd floor. To ferry passengers through miniature enchanted realms. Must be comfortable speaking to small groups in tiny settings. To work with the “Happiest Horses on Earth.” Apply at the Pony Far. Ask for Owen. To work with Macaws, Toucans, Cockatoos in new tropical musical comedy revue. Contact Jose, Enchanted Tiki Room. Team needed for fireworks spectacular. Shows 7 evenings per week in summer. Skyrocketing benefits; booming opportunities. Enjoy the “sweep” smell of success! Experienced crew needed for world-famous entertainment production. If no mess too small for you, send resume now! New hires guaranteed to clean up! Seeking experienced drivers to carry passengers through Nature’s Wonderland and the Painted Desert. Apply Rainbow Ridge. Sign-ups tomorrow. No. 5 Matterhorn Court. Meeting at 7pm where the old Red Wagon Inn used to be. You know where that is. 6am Friday. Riverfront area. Bring paddles or substitute. 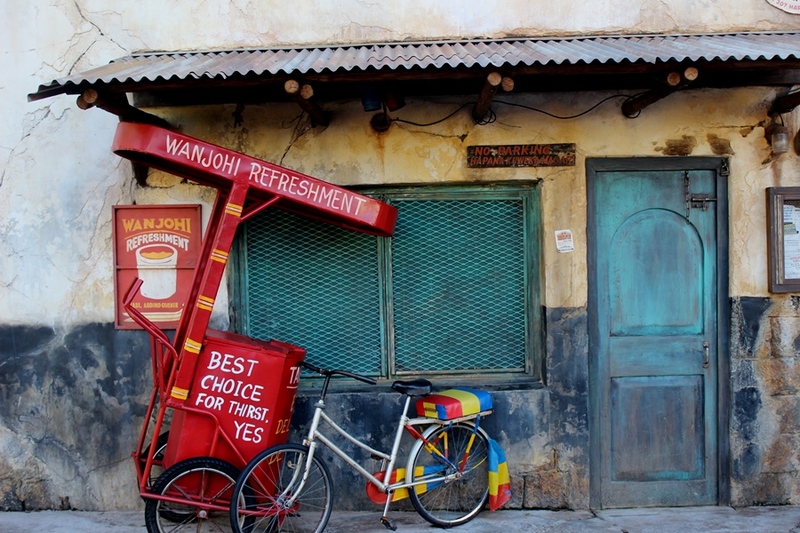 Six years ago, in the summer of 2010, Disney’s Animal Kingdom held an event in Africa for three weeks in July. 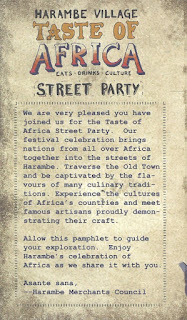 Known as the Taste of Africa, the festival was billed as a street party taking place in Harambe. 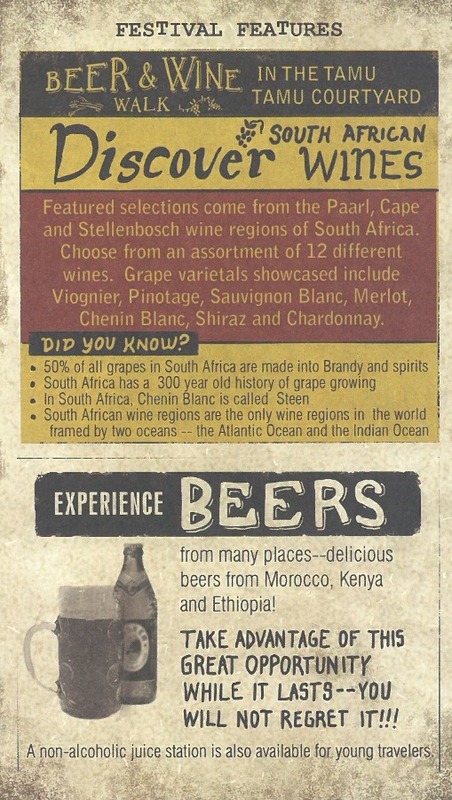 The main focus of the event was on food and beverage offerings, along with cultural elements, from Africa. You could think of it as a miniature version, or a test run, of the Epcot International Food & Wine Festival in another park. This was before Harambe was expanded and more of the village was accessible to guests, before there were a variety of food items available at the Harambe Market, and before music and dance permeated Harambe daily. Each of the food and beverage stations included tangible, real world examples of how items were prepared. Occasionally, these demonstrations were even hands-on! It was, by all accounts, a huge success, but for whatever reason the event never saw the longevity of Epcot’s festival. 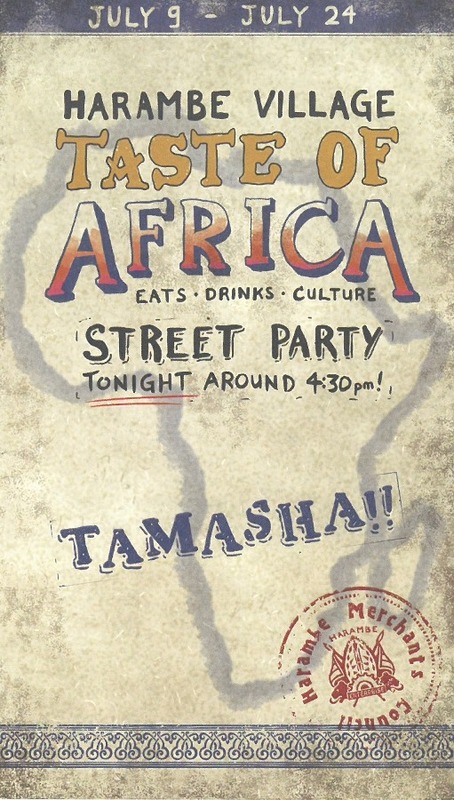 The attention to detail within the various stations was matched only by the takeaways from the Taste of Africa. For starters there were recipe sheets, which covered everything from curry and baba ghanoush, to chutney, hummus, bobotie, tabbouleh and even banana bread pudding and baklava. Just thinking about these recipes makes me want to rush to the kitchen and start cooking! But the real prize here, in terms of takeaways, was the festival guide. 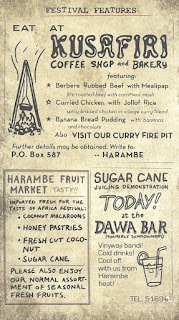 It was created to give the Taste of Africa a sense of place, firmly rooted in the people and industries of Harambe. 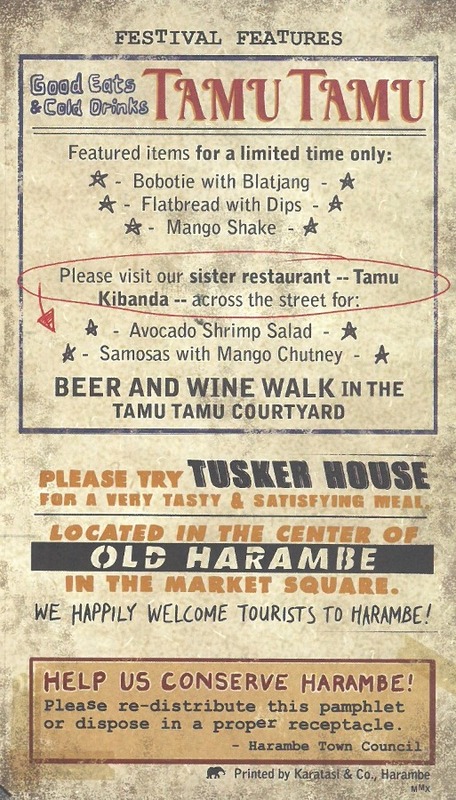 For starters, it was put together by the Harambe Merchants Council. There were featured items to look out for which appear to have been photocopied into the pamphlet, and each represented a different restaurant or business. 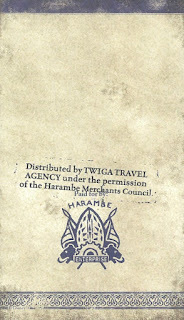 The whole thing was put together and printed by the local printers, Karatasi & Co. Karatasi, in Swahili, means paper for what it’s worth. 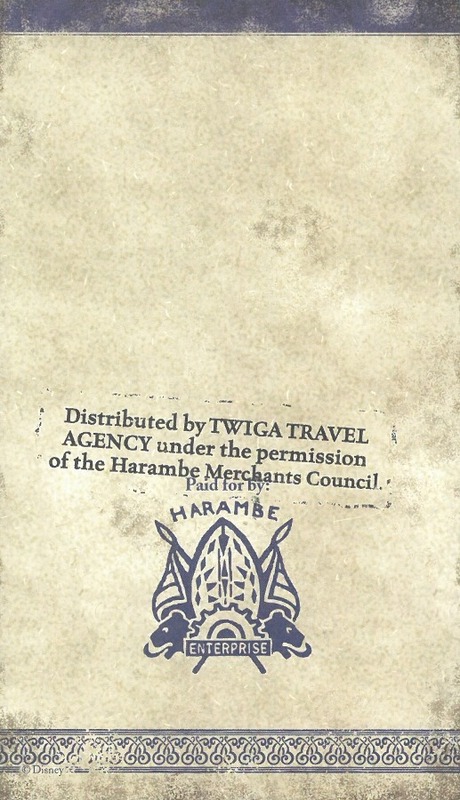 Twiga Travel Agency, a popular travel agency whose products and postings can be seen all throughout Harambe, helped fund the guide and its distribution. 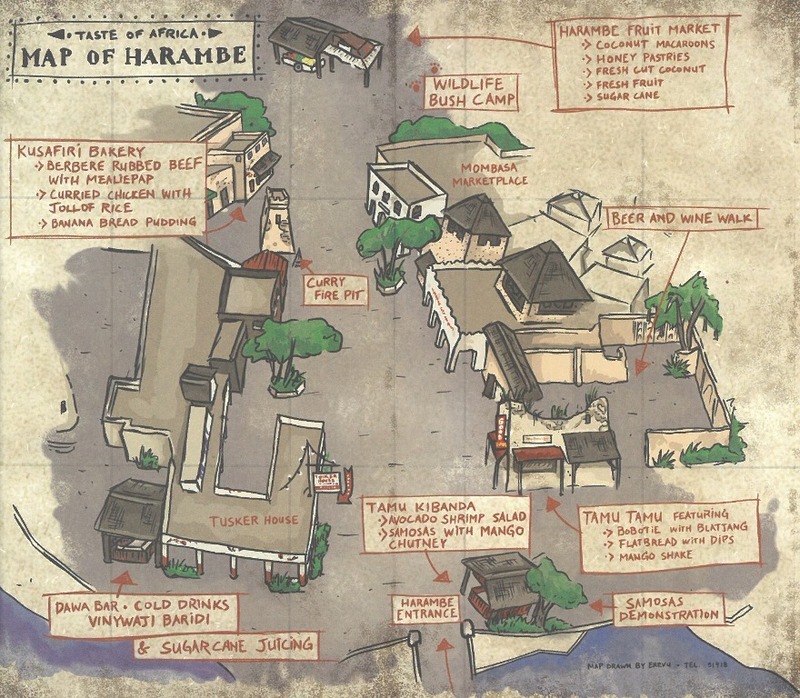 Even the map was created by a local artist or cartographer named Erevu. 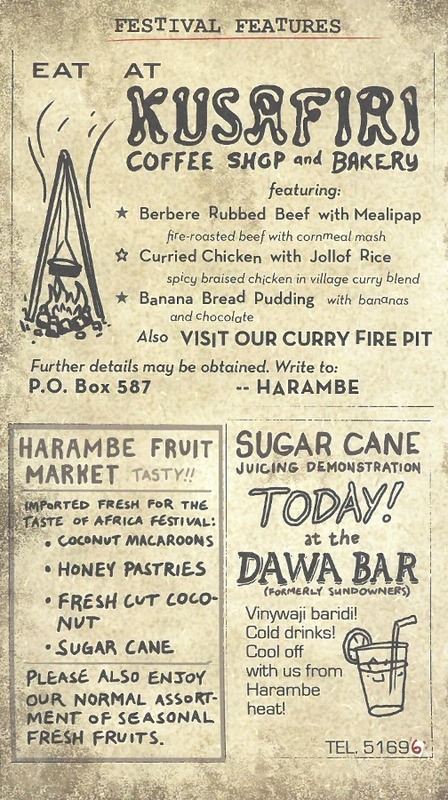 Yes, there were a lot of tasty dishes and delicious beverages to be sampled during the Taste of Africa, many of which have made their way to either the Harambe Market or Dawa Bar. 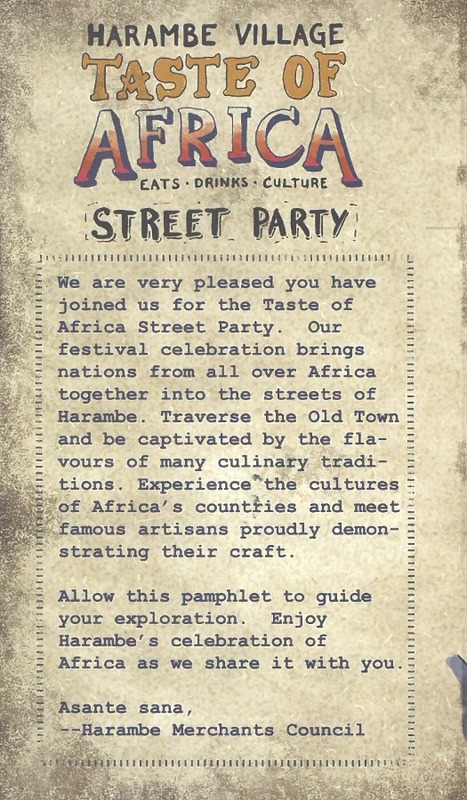 The cultural aspects that truly made this a street party have lived on in the form of Burudika to the Tam Tam Durmmers in Harambe, but even beyond Africa into other areas of the park, including DJ Anaan and Chakranadi in Asia and the recently unveiled Carnivale of Discovery Island. It’s a shame that the event never gain any momentum, however, I’m happy (at least the ephemera geek in me is) we have these incredible guides to look back on! 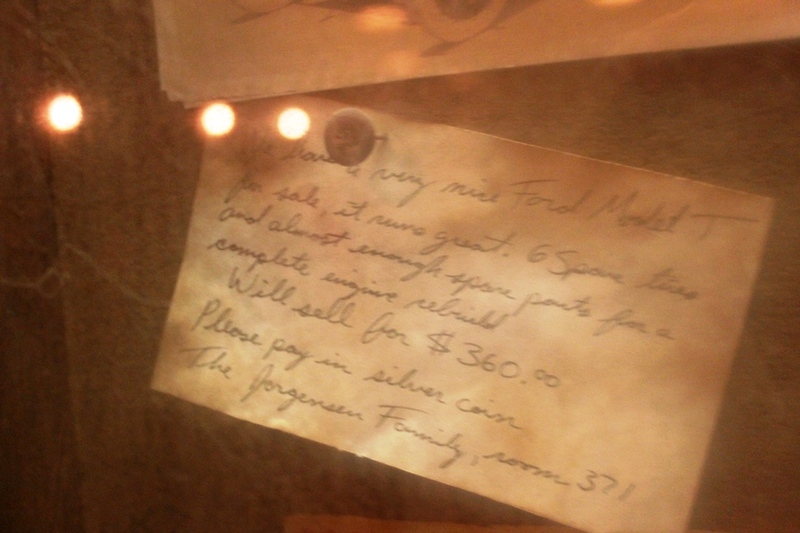 There are a lot of details and nods to The Twilight Zone scattered throughout the Hollywood Tower Hotel, aka The Twilight Zone Tower of Terror. Some of them require an astute knowledge of the tales that permeated the show, while others are more direct in their relationship to what lies beyond the fifth dimension. There are also a number of pieces simply meant to set the time and place of a hotel that was abandoned on the dark side of Hollywood in the fall of 1939. Then there are those pieces, much like the one we’re examining today, that could be an innocuous piece of set dressing or something a bit more sinister. They don’t have any direct correlation to The Twilight Zone, but they seemingly tell a story, or preface a story, that could live within that world. Take this notecard for example. It can be found on a bulletin in the maintenance area at the end of the attraction, where guests can view their ride photos. Nothing out of the ordinary here, right? A family is simply selling their old car. But why? They’re in a hotel, possibly on vacation or there on business. Do they live in the hotel? Did they decide to stay in the area and realized that they didn’t need a car? Even if they were staying in Hollywood, given the day and age, they would surely need some means of getting around aside from trolleys and transit. Did they run up an incredible bill from room service and have to find a way to pay for it? Why did they have six spare tires? 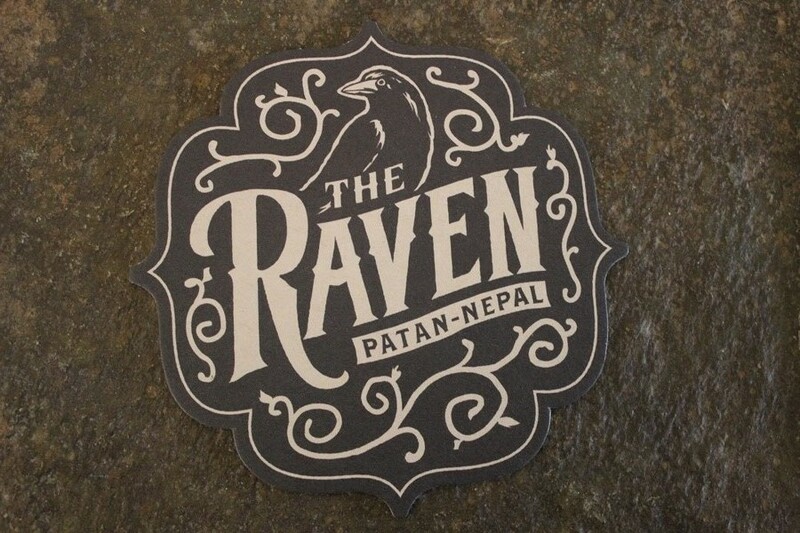 Is something enticing them to stay in the hotel, even though they know it’s time to leave? Model T’s had stopped being created in 1927, even twelve years on might be a stretch to see one of these on the road, much less someone purchasing a used vehicle for $360, when that was the brand new price in 1927. Are the Jorgensens a step removed from their own time? The answer to any one of these questions could lead us down a rabbit hole that was so often the hallmark of The Twilight Zone, where everything is just an inch off of center. Perhaps there is nothing to this note, and we may never truly know one way or another. In fact, it’s best left to our individual imaginations. 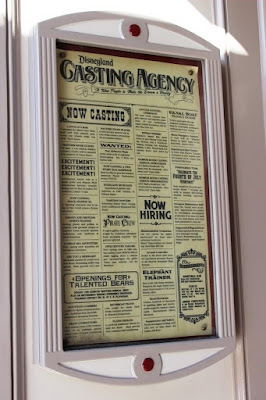 For my part, however, I’d like to think it was left here as a way to connect the Hollywood Tower Hotel to whole host of stories it contains. Some of them we’ve heard of, some of them we haven’t, but one thing is certain, there is always room for more stories in The Twilight Zone. Ice cream has always been a staple of summer. Cones, cups, floats, and sundaes, you name it, and it has staked its claim to the longest and hottest days of the year. It should come as no surprise then that in 1984 President Ronald Reagan designated July as National Ice Cream Month and the third Sunday in July, this year it falls on Sunday, July 17, as National Ice Cream Day. While it feels like every single day is a national day of recognition for something, I think we can all agree that ice cream definitely deserves its day in the sun. Walt Disney World is filled with tons of ice cream dishes to satisfy your need for treats, but today we’re looking for the one ice cream delight that gussied up ice cream and made it a truly fanciful dessert. There’s no other place to look for the best in Walt Disney World ice cream than L’Artisan des Glaces. And there’s no other dish quite as extraordinary as the Croque Glace. What is the Corque Glace? It is the fanciest ice cream sandwich you’ve ever had the pleasure of sinking your teeth into. You take your favorite flavoring of ice cream, topped with chocolate or raspberry sauce, and then placed inside a brioche that is then pressed and warmed. We’ll get back to the ice cream in just a moment, but, the brioche is worth talking about on its own for a minute. The rolls or buns, however you’d like to distinguish them, are freshly baked throughout the day. Each on is extremely light and airy, the equivalent of a bread pillow as it were. The outside is crisp and flaky, and each bite is perfectly chewy. Let’s be honest, the French have been doing bread for a long time, and they are the experts here, so this is an excellent example of what brioche should be. Now, back to the ice cream! As you get to choose between the two sauces and you get your own choice of ice cream, you really are one of the chefs responsible for making sure that the right flavor combination comes through. Of course, with the variety of ice creams changing regularly at L’Artisan des Glace, the possible combinations could potentially be overwhelming. One of my favorite combinations, however, is the Cinnamon with Caramelized Pecans ice cream and top it with the chocolate sauce. While I found this arrangement in late spring, it tastes just like Christmas. You have the chocolate sauce mixing with the cinnamon and the rich creaminess of the ice cream to create a flavor that is close to a perfect cup of hot cocoa. Throw in the caramelized pecans, which have softened to a tender state from the caramelization, and you can have Christmas in July, or all year round, if you like! Ice cream has long been a staple of the Walt Disney World diet. From Citrus Swirls and Dole Whips, to Mickey Bars, or sundaes on Main Street, U.S.A., ice cream is included in some of our fondest memories. Like all kinds of cuisine, ice cream has been stepping up in a big way around Walt Disney World to offer up unique and innovative options for those seeking something new and high quality. 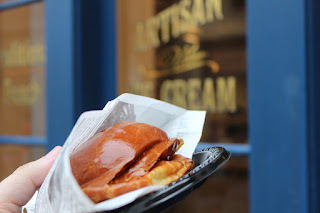 Should you find yourself in Epcot roaming through World Showcase on one of these hot July afternoons, especially if it happens to be on National Ice Cream Day, I guarantee you’ll find a new go-to ice cream sandwich if you stop by L’Artisan des Glace for a Croque Glace. There is so much more to the Tree of Life than it is given credit for, but sometimes you have to have a sense of wonder in order to see it all. 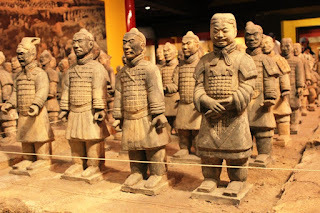 Take, for instance, the sculptures. We’ve marveled at them for almost 20 years now, and with the new Awakening affects, each carving truly takes on a life of its own and shares its story with guests. But what about the carvings that are as apparent or appealing to the naked eye? Have you ever ventured up to the border between the Tree of Life and the rest of Discovery Island? While in that spot, likely getting a photograph of your friends or family, did you happen to notice this log? 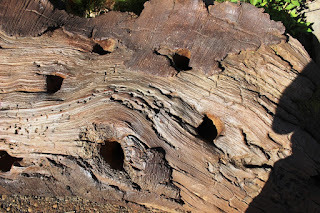 At first glance it could simply be a part of the tree that has become infested with insects. After all, It’s Tough to be a Bug is a key attraction of the Tree of Life. And if that was you’re thought, you’d be very close to correct. This section of the tree is to remind guests that all creatures, great or small, are critical to the ecology of any given environment. They are the pollinators and the fertilizers, and they do amazing things to help the natural world carry on. We may call them pests, but they have specific jobs to do, and more often than not, they carry on invisibly to larger creatures, including us humans. 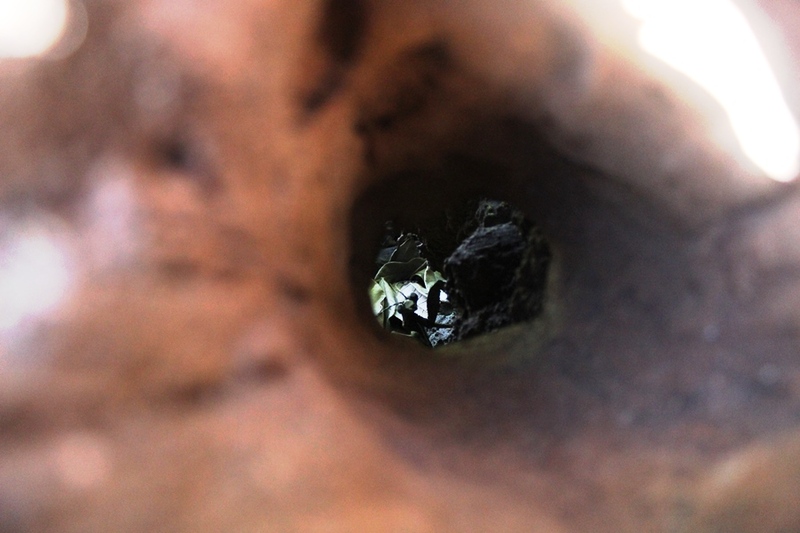 However, a log filled with holes isn’t very good at provoking thought or storytelling on its own is it? It would need inhabitants, some of those insects we spoke of, to help further the tale, wouldn’t it? Go ahead; pick out any one of the holes to peek into and you’ll find a scene very much like this one. The log is the perfect size for those younger guests who are constantly exploring their world. 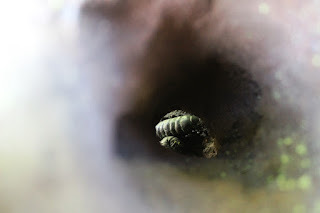 In fact, if you have seen these bugs before, chances are it is because a toddler or small child look in here first and got excited for that they saw. The insects are crucial to our way of life, which means that they are an integral part of the stories being told at Disney’s Animal Kingdom, and, rightfully so, they are given some prime real estate right front. Of course, it’s still up to us to seek them out and notice them. One of these years, we’re going to not talk about the Bicentennial celebration that took place in Walt Disney World and Disneyland known as America On Parade. This, however, is not that year. What I can promise is that we’ll keep it short and get to the good stuff quickly this Independence Day. While America On Parade was taking place, there were some amazing visuals to take in. However, the music may have turned out to be the true star of the show. We’ve talked in years past about the music selections and how they were created. Today, however, we’re going to acknowledge the contributions of two of Disney’s perennial musical legends, the Sherman Brothers. 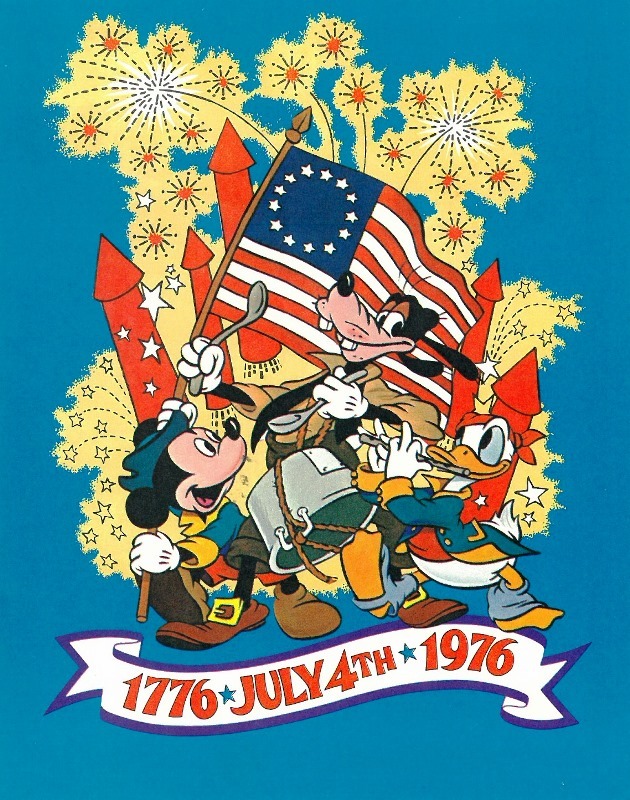 Richard and Robert Sherman returned to Disney to create a song for America On Parade. 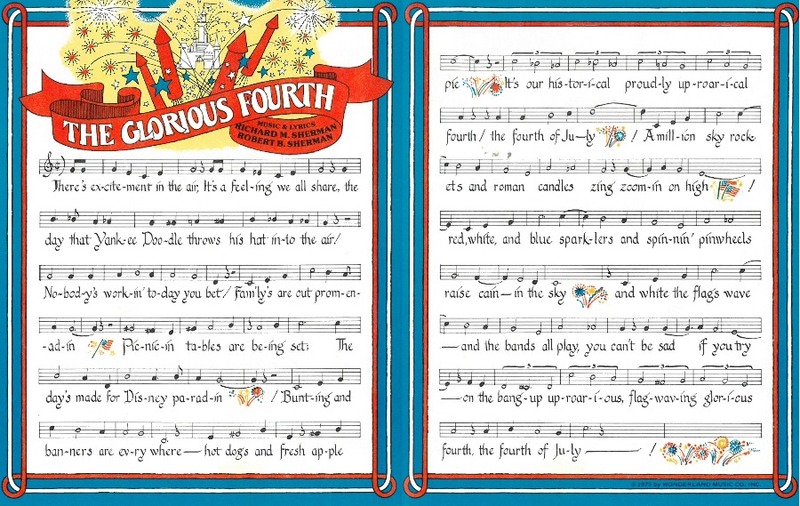 The song, The Glorious Fourth, was one of the highlights of the show. 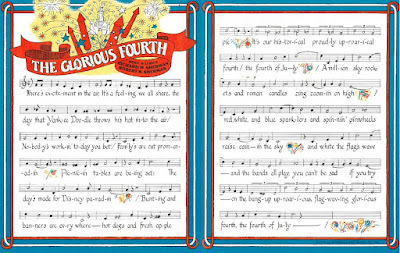 As The Glorious Fourth was a new tune, Disney wanted to make sure guests could see along to their patriotic heart’s content and created little song pamphlets for guests to use. Go ahead and sing this one around your house today, it’s a fun song that will definitely let your spirits soar! 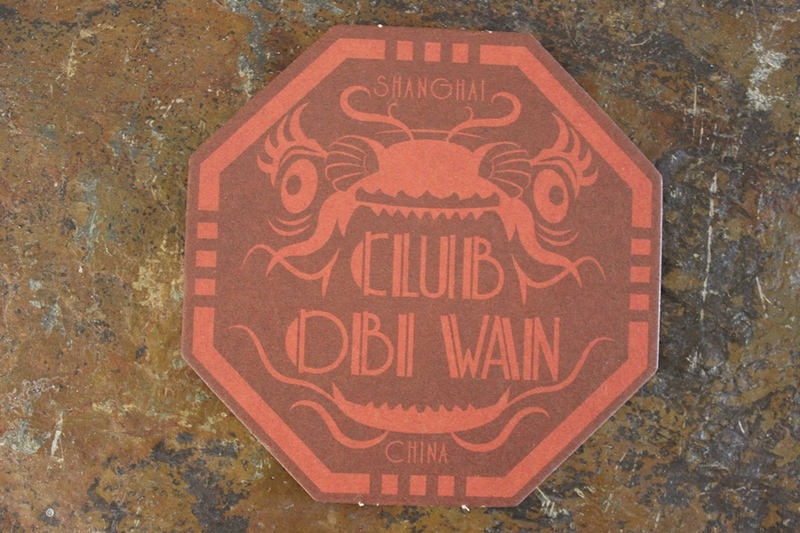 There are bits of history scattered all throughout Walt Disney World. Some of it is fictitious and quite a bit of it has to do with the film, animation, or theme park history of all things Disney. However, there are some pieces that harken us back to moments and places in time where the world we enjoy today took shape. Liberty Square is one such location, but have you ever stopped to truly admire some of the artifacts there? 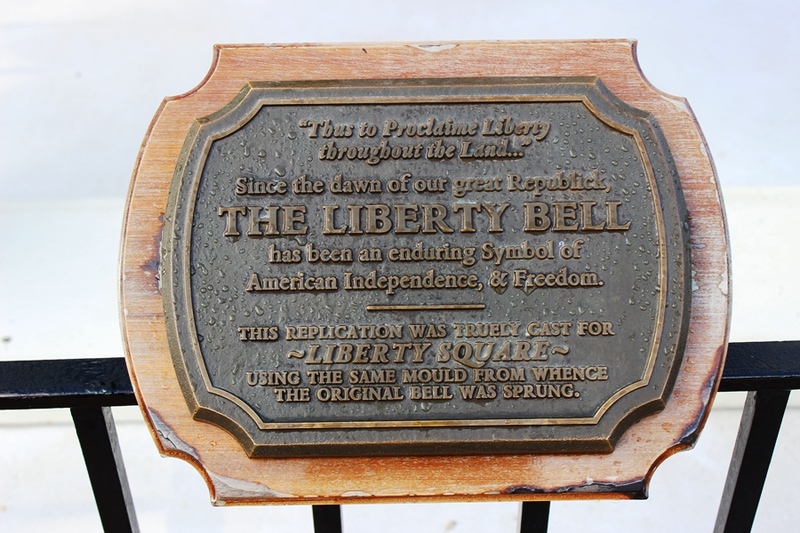 How much do you know about the Liberty Bell on display in Liberty Square? Today, as we look towards celebrating our Independence Day, we’re taking pause to tell the story of the bell. The Province Bell was the name first used to describe me. I was ordered from the English bell foundry of Whitechapel in 1751 by the Pennsylvania Assembly. I was to be part of the celebration which would commemorate the 50th anniversary of William Penn’s Charter of Privileges signifying the founding of Pennsylvania. Soon after being brought to America from England it was decided to test me for tonal quality. For this purpose I was hung in the notch of a tree and struck. With the first stroke of the clapper I sang out a glorious note. However, with the second strike I cracked and then gave off a terrible sound. I was muffled as a symbol of protest and tolled slowly when the Sugar Act of 1764 and the Stamp Act of 1765 were passed into law. I continued to toll for the First Continental Congress in 1774. The time I remember best was on July 8, 1776, when I summoned the citizenry for the reading of the Declaration of Independence. It was during this era of unrest that I became known as The Bell of Independence and The Bell of Revolution. During the Revolutionary War I was wildly rung to signify each victory and muffled and tolled slowly to announce each defeat. The people could judge the success of the war effort just by the way I was rung. I became so important to the people that when Philadelphia was invaded by advancing British forces, I was taken to Allentown, Pennsylvania and hidden in the floorboards of a church so the British wouldn’t find me. After a year in hiding, I was returned to the State House in Philadelphia. On September 3, 1783 I was rung joyously to celebrate the signing of the Treaty of Paris which ended the war between Great Britain and the United States. After eighty years of almost continual use, I was rung to mourn the death of Chief Justice Marshall on July 8, 1835 and cracked. In 1846, I was rung for the last time to commemorate George Washington’s birthday. Although I can no longer be actually rung, I still occupy a special place in American history. The Herald of Freedom and the Liberty Bell are the names by which I am best known today; and perhaps these are the names which best describe me, for when the freedom and liberty of the United States hung in the balance, my voice was used to rally the people to the cause of Liberty. Obviously the bell in the Magic Kingdom is not the original Liberty Bell. However, it is a relative of that very same bell, in fact it is what is known as a second generation bell. Utilizing the same mold that was employed in the creation of the Liberty Bell, a bell was cast as a perfect replica for Walt Disney World in 1989. I supposed we could call it a much younger sibling if we wanted to. Regardless of how we define its genealogy, it is a remarkable piece of history sitting on display for all to see in Liberty Square. Yet, so often, this area is hurried by in order to get to the next headline attraction. 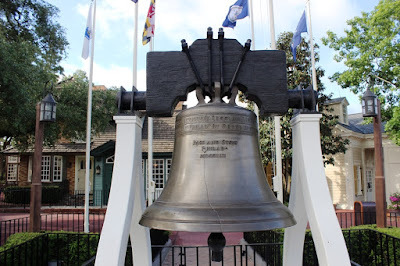 The next time you happen through Liberty Square, especially if it happens to be this weekend, take a moment to examine the Magic Kingdom’s Liberty Bell and remember all the history that has brought us to today.